What defines us? Our family, our environment, our community, our ethnicity, our gender, our religion, our politics? Before her solo show “Made in Space” opens on Saturday, 12 May at 6pm, artist April Bey will be addressing these and other questions on a panel hosted by @Artillery_Mag earlier that day. Most artists and creative types question this throughout their entire life and career. This is known as Identity Art, and that is the theme of our panel discussion (and the May June issue of Artillery!). The moderator will be none other than Artillery’s Associate Editor, Christopher Michno. .
Join us at the Cypress Park location of Bermudez Projects. It’s also a reminder that April’s Made in Space solo show at Band of Vice’s flagship gallery location will open on Saturday, 12 May 2018, with an Opening & Artist Reception from 6pm – midnite. Also, April will also be conducting an Artist Talk of her work, at the gallery, on Saturday, 2 June, from 4pm – 6pm. Band of Vices Art Gallery is located at 5376 W. Adams Blvd., Los Angeles, CA 90016 in the West Adams (Arts) District, on the corner of Adams & Burnside Avenue. On Saturday, May 12th, Terrell Tilford will be opening the flagship Band of Vices Art Gallery, located at 5376 W. Adams Blvd. in the burgeoning West Adams (Arts) District. Band of Vices will be the newest addition to recent developments and new restaurants coming into the area. Tilford is honored to continue the artistic commitment originally set forth by the previous tenants, @Gallery38. 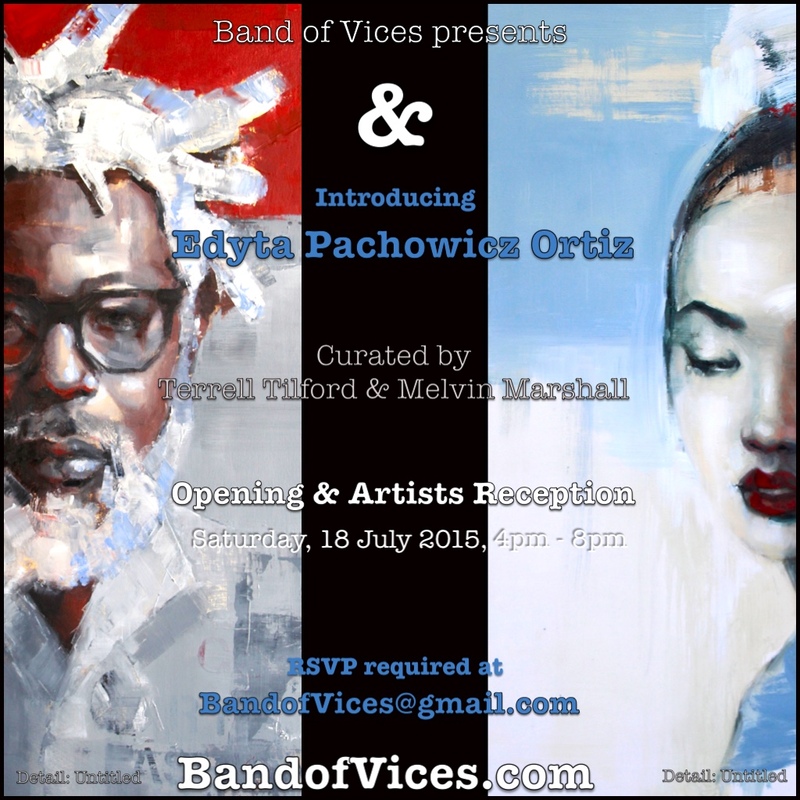 After undergoing an extensive renovation, Band of Vices will open its doors with a solo exhibition by contemporary artist April Bey entitled Made in Space. Made in Space is the brand or label we see on clothing and space helmets used by gender fluid universe travelers focused on anti-colonizing adventures. 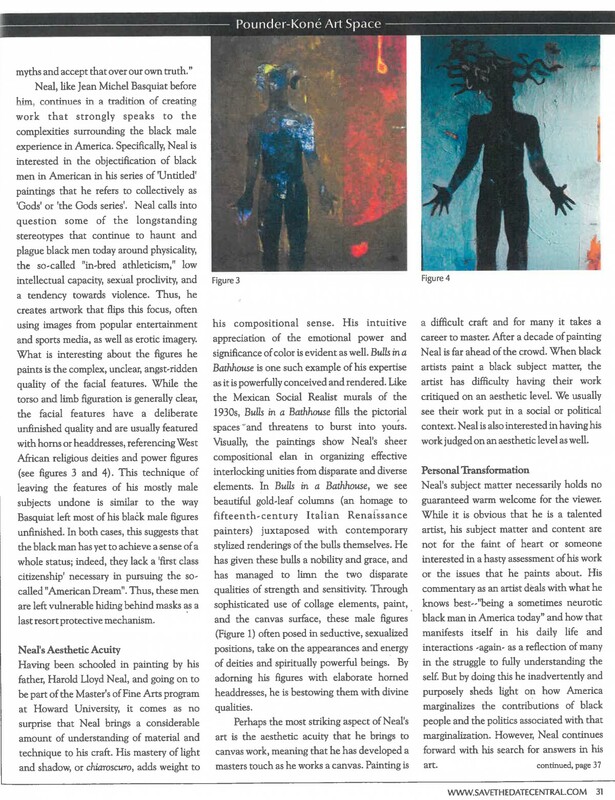 Made in Space includes works from the AfroFuturist Womanism series, which explores female afrofuturistic millennial entrepreneurialism via social media and the Internet. Blerdy in nature, juxtapositions of Star Trek and hip-hop culture also manifest in this series. Looking to the future acts as a therapeutic excretory practice in dealing with current day issues around race and discrimination globally. The Opening & Artist Reception for April Bey’s solo exhibition will take place Saturday, the 12th of May 2018, from 6pm – midnite. 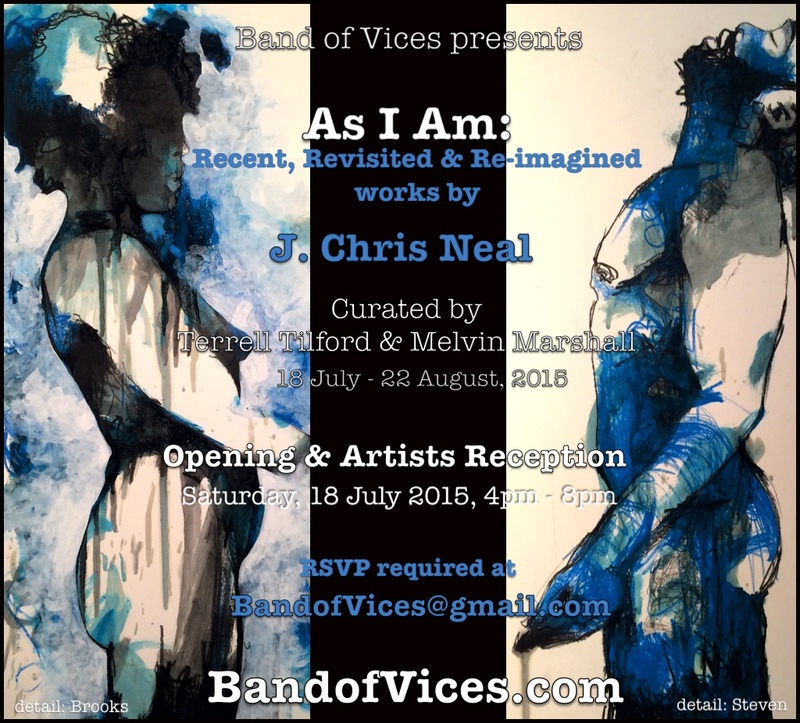 Made in Space, curated by Terrell Tilford, marks April’s first exhibition with Band of Vices Art Gallery. Tilford, a native Angelino, is also a professional actor who has been seen on various television series and classical theater stages. This is his second contemporary art gallery in Los Angeles, after rebranding Tilford Art Group (1999-2010) into Band of Vices in 2015. For further press inquiries, please contact the gallery at BandofVices@BandofVices.com or at 323.480.4220 (no texts). After the Opening, the gallery hours will be Wednesday – Saturday, 12pm – 5pm. Outside hours will be available By Appointment Only. Perspective: An Online Survey of Figurative Works spans the continental United States and includes a wide range of emerging, mid-career, established and historical Artists. The artworks in this survey invite the viewer to explore such everyday concepts and themes as the human condition, beauty, identity, religion, portraiture, history & culture and nudes, among others. This exhibition encompasses an incredibly talented group of artists including such leading African American figures as Harlem Renaissance sculptor Richmond Barthé (1909-1989), master printmaker Margaret Burroughs (1915-2010) and Charles White (1918-1979), one of the most recognized & revered Social Realism artists. 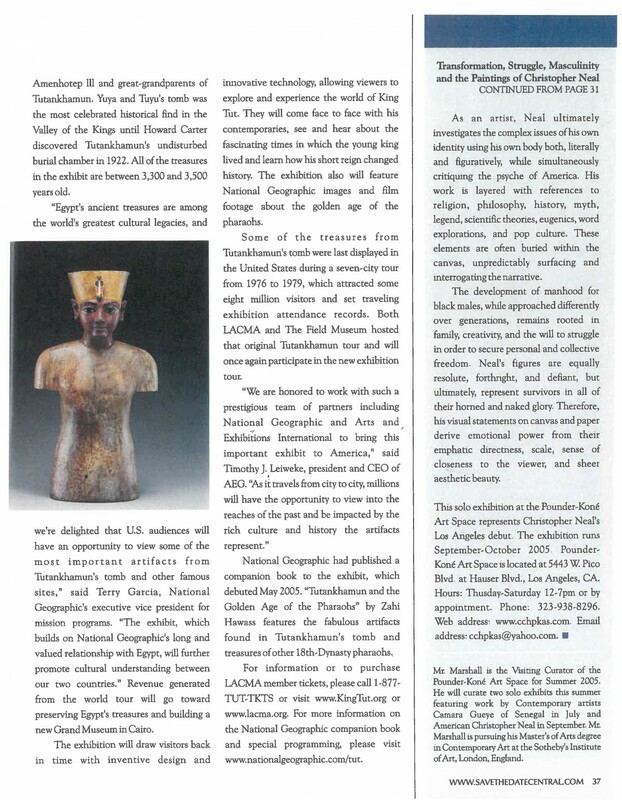 This broad exhibition includes two stunning bronze sculptures, and other outstanding examples of paintings, works on paper, & important historic prints. Contemporary master muralist & painter Richard Wyatt, Jr. (b. 1955) known for his figurative realistic works that honor everyday people & historical figures, is another highlight of the exhibition. Jose Ramírez has two beautifully rendered works on canvas representing the significant contributions that Chicanos have infused into our rich fabric of American life. Francks François Deceus brings forth his Haitian heritage to his oeuvre, making us consider these rich and engaging Caribbean-infused elements. And Toni Scott has added her voice with a frenetic, compelling oil on canvas rendering. These artists want us to recognize that art has its own generative power. This is their perspective. This show introduces Houston-based interdisciplinary Artist, Robert Hodge with New Artworks by Edyta Pachowicz & Bryan Lee Tilford. To RSVP for this Free event, click the link in our Bio. Both days will include a bespoke menu, compliments of our partner DEW Foods and a few other surprises… Check us out at BandOfVices.com for more Inspiration & Info on our upcoming Exhibitions & Events. BandOfVices.com. OPENING Friday, 4 November, 2016: Dare I Do – a visual elixir – pop-up Art Show… This show introduces Houston-based interdisciplinary Artist, Robert Hodge with New Artworks by Edyta Pachowicz & Bryan Lee Tilford. 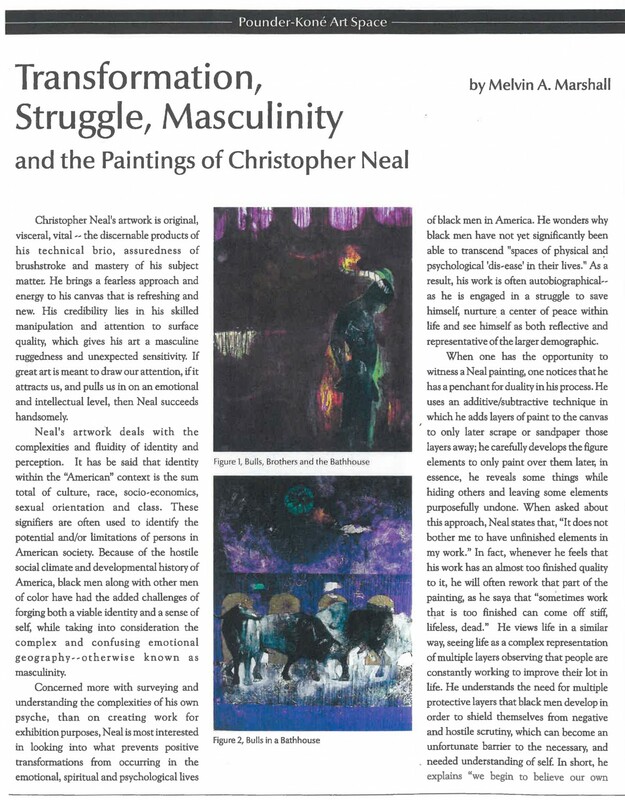 As we prepare for As I Am: Recent, Revisted & Re-imagined works by J. Christopher Neal, here’s a critical look at the painter’s previous works. The exhibition, curated by Melvin Marshall at CCH Pounder’s Pounder-Kone Artspace in 2006 received a strong response.